CHC Australia is proud to announce that Maria Coutinho has received the Australian Helicopter Industry Association Award as 'Australian Helicopter Support Person of the Year'. 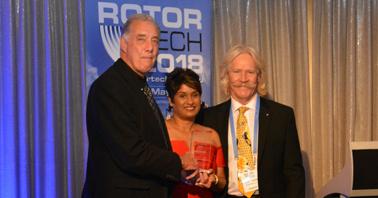 The award was part of a national series created by the Board of the Australian Helicopter Industry Association to recognize and reward excellence in the industry. It was presented at the 2018 AHIA Annual Awards Gala Dinner earlier this month during an event at the Novotel Twin Waters Resort on the Sunshine Coast. With over 12 years’ experience in managing Karratha bases for helicopters, Maria received the award to acknowledge her outstanding leadership in remote locations and dedication to using knowledge and experience to benefit the company. Working for CHC Helicopter since 2010, Maria has proven herself to be a trusted, highly qualified and invaluable employee. We are delighted to now have her in CHC Helicopter’s Perth Office, after taking over the role of Operations Centre Manager.